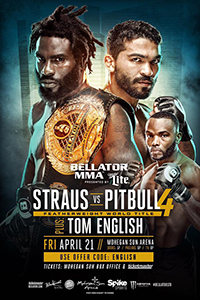 Bellator 178: Straus vs. Freire 4 took place April 21, 2017 at Mohegan Sun Arena in Uncasville, Connecticut. • Mak Kelleher vs. Don Shainis: Don Shainis defeats Mak Kelleher via unanimous decision. • Regivaldo Carvalho vs. Jay Perrin: Regivaldo Carvalho defeats Jay Perrin via submission (guillotine choke) at 2:04 of Round 3. • Kemran Lachinov vs. Sam Watford: Kemran Lachinov defeats Sam Watford via split decision. • Daniel Straus vs. Patricio Freire (FW Championship): Patricio Freire defeats Daniel Straus via submission (guillotine choke) at 0:37 of Round 2. • Ilima MacFarlane vs. Jessica Middleton: Ilima-Lei Macfarlane defeats Jessica Middleton via submission (armbar) at 2:15 of Round 1. • Tom English vs. Blair Tugman: Blair Tugman defeats Tom English via submission (rear-naked choke) at 4:54 of Round 3. • Tim Caron vs. Jordan Young: Jordan Young defeats Tim Caron via submission (D'Arce choke) at 3:55 of Round 1. • Branko Busick vs. Tyrell Fortune: Tyrell Fortune defeats Branko Busick via unanimous decision (29-27, 29-27, 29-27).